Tea anyone? 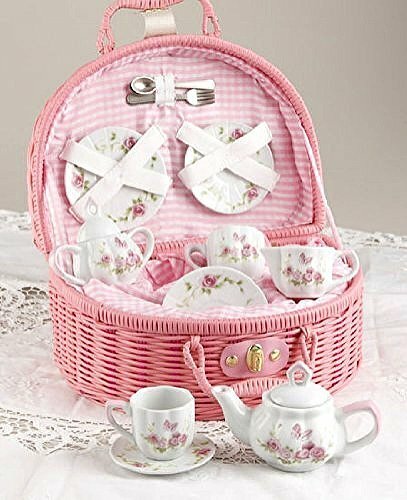 The Butterfly Porcelain Tea Set Basket from Schylling Toys, the world leader in traditional toys and classic fun, adds beauty and color to your tea party. Invite all your dolls, or your best friends, to join in as the hostess serves tea and goodies in the garden. This 23 piece set includes 1 tea pot with lid, 1 sugar bowl with lid, 1 creamer, 4 cups and 4 saucers, 4 spoons, 4 napkins, a tablecloth and special basket. All of these pieces are beautifully adorned with beautiful butterflies. The wicker-design basket carries all your tea set needs, has a sturdy latch closure and a handle. For Ages 8+. 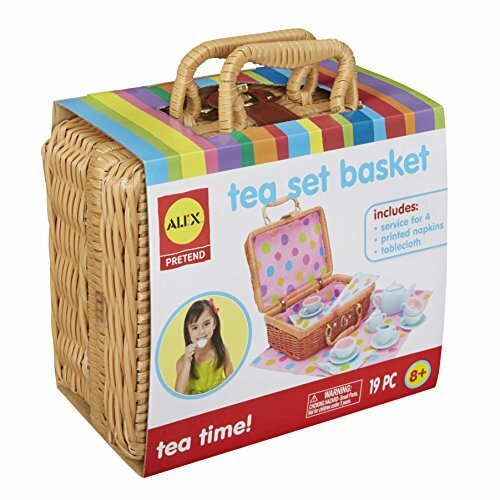 ALEX Pretend Tea Set Basket is a charming little crate filled with everything you need for afternoon tea.Have all your friends and maybe even a family member over for a spot of tea.The weaved basket holds this entire tea set together and makes transportation simple as your child brings his or her set from one tea party location to another. All supplies fit neatly into the basket, including adorable matching polka-dot napkins and a tablecloth to set the scene. 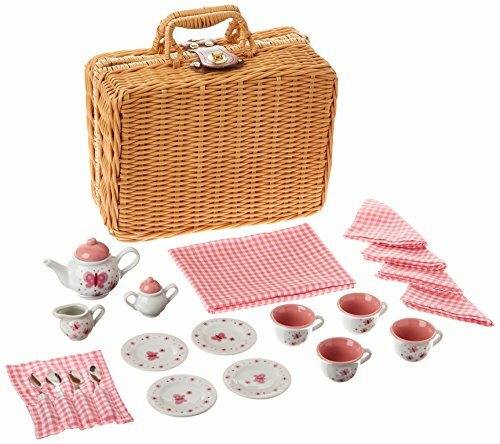 The set comes with a porcelain teapot, teapot lid, creamer, sugar bowl with lid, 4 cups, 4 saucers,matching pastel polka-dot napkins, tablecloth and carrying basket. Recommended for children 8 years of age and older. Tea for Two!Don't these chocolatey treats look rich and delicious? Choose from our tantalizing tiramisu, delectable donut, sensational sweet swirl, cocoa cupcakes, creamy cake slices, and tasty torte. 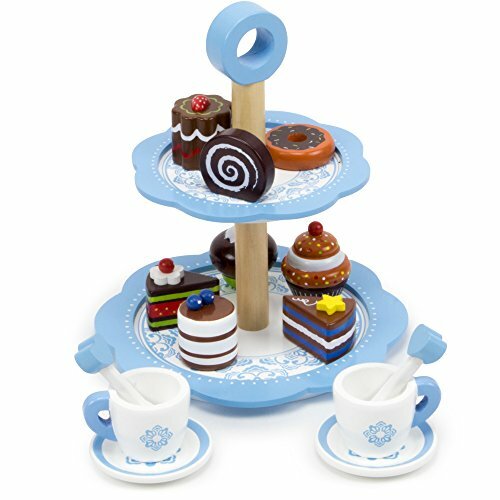 They're so delicious they'll melt in your mouth!Tea parties are a great way to develop crucial social skills like serving others, taking turns, and sharing, and this chocolatey pastry tower makes one sensational centerpiece! So fill up your tea cup, stir in a little milk, and sample some of these delectable treats!Why you'll Love it:Each of these wooden pastries is uniquely designed for extra tea time fun. Watch as little ones use their imagination to create a fabulous afternoon tea with their friends or stuffed animals. The tower measures 10" tall and mixes well with other wooden treats and our white cake pastry tower. Made from natural cuts of wood and decorated with safe, water-based paints. Fairy Tale Tea Set and Carry Case It's time for a fabulous fairy tea party! 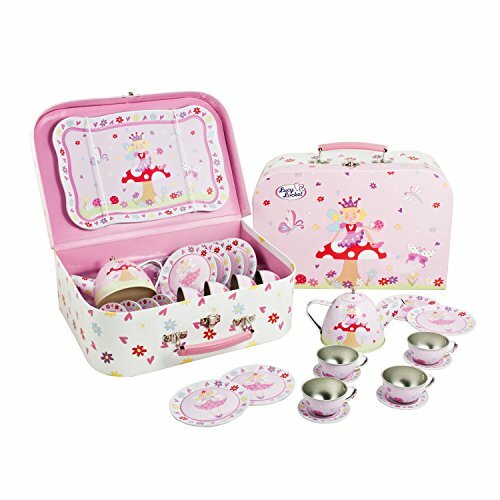 Capture your childs imagination with this pretty fairy tale 14 piece tin tea set and carry case. 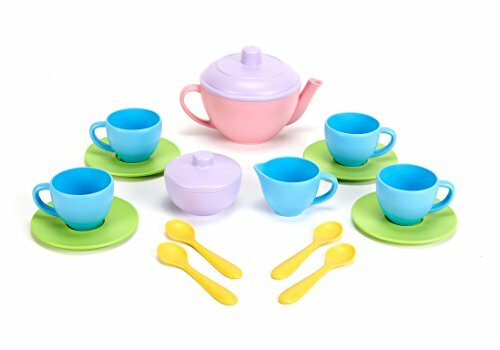 Includes 14 piece kids tea set 4 plates (3.5 inches diameter) 4 cups (1.9 inches diameter x 1.18 inches high) and saucers (2.2 inches diameter) Tea Pot (4.72 inches for handle to spout x 3.14 inches high) Carry Tray (9.4 inches high x 6.1 inches wide) Matching laminated cardboard carry case (11.5 x 7.6 x 3.7 inches) Featuring a beautiful fairy tale theme, each piece in this pretty pink tea set for kids is illustrated with adorable fairies and magical creatures. The entire tea set comes packed in a matching carry case - perfect for keeping everything safe and together when it's not being played with or for taking on visits to grandparents, friends or even on holiday. The carry case is made from reinforced laminated cardboard which is light enough for little people to carry but strong enough to endure lots of playtime fun. 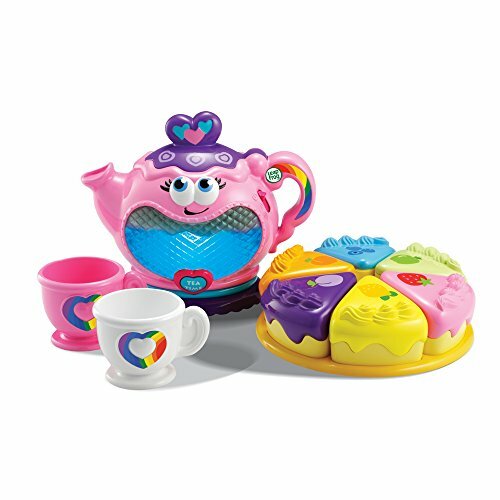 Kids will love throwing magical make believe tea parties with this wonderful tea set and matching carry case. It makes a lovely traditional gift that will inspire hours of playtime fun. 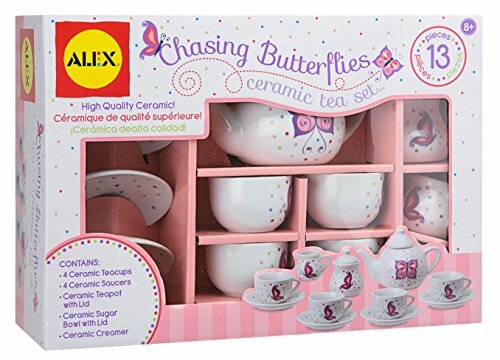 ALEX Toys Chasing Butterflies Ceramic Tea Set lets you have tea time anytime! This 13 piece service is made of high quality ceramic and is decorated with a beautiful butterfly theme. A very delicate pattern for a sophisticated party. The set includes 4 teacups, 4 saucers, tea pot with lid, sugar bowl with lid and creamer. Recommended for children 8 years of age and older. Quality porcelain ceramic tea set in fabric lined basket. Beautiful and fun, whether you are hosting a tea party or just playing kitchen. Butterfly and Rose design with pink gingham fabric lining. Set contains Teapot, Creamer, Sugar Bowl, 2 Cups, 2 Saucers, 2 Plates, 2 Forks & 2 Spoons. Basket measures 12 x 8 x 6 inches. Emma helps her Uncle clean up the backyard and her Uncle gives her a surprise gift. It’s a Disney princess Belle musical tea party cart. Emma changes into Belle’s dress and becomes a real Disney princess. They have a tea party and drink tea and play with a pretend food cake.